Figure skating legend Evgeni Plushenko performed unexpectedly poorly in the free skating at Russian Nationals Wednesday and lost to 18-year-old Maxim Kovtun. However, Plushenko hasn’t given up yet his dream to compete in his fourth Olympic Games and it will be a tough decision for the Figure Skating Federation of Russia to make who will get the lone spot in Sotchi. Plushenko looked confident in the morning practice, but in his program, his usual consistency suddenly left him. He pulled off a quad toe, but then tripled the next planned quad. A triple Salchow and loop were okay, but disaster really struck when he doubled a triple Axel and added another double Axel as a sequence. He went for the Axel one more time, doubled again, and since you cannot repeat the double Axel three times, this jump didn’t count. The Lutz was double as well and only in the end Plushenko hit a triple Axel, but it was too late. His spins got level three and fours, but that didn’t save him either. The program, too, suffered from the mistakes. The three-time World Champion lost the free skating by about 11 points and fell to second place at 261.37 points. “I don’t really know what went wrong”, Plushenko said. “I didn’t make a single mistake on the quad in practice, I did great triple Axels, I did all elements. I was so well prepared that maybe I was overconfident to just go out and everything works. My legs were tense. Maybe I warmed up too much on the floor. But this isn’t the worse disappointment in my life. I will continue to work and train.” The 31-year-old noted that he didn’t plan to go to Europeans, but might reconsider now. Kovtun did well. He landed a quad Salchow, quad toe, two triple Axels and two more triples, just popped another planned quad Salchow. “I am incredibly happy now. I was able to overcome myself, I wasn’t really prepared. This will give me confidence. I was really nervous and it was hard to skate.” He now wants to take a little break of about six days and then get ready for Europeans. “I didn’t do my five quads (two in the short and three in the free) yet this season, and I will work on this”, he commented. Sergei Voronov claimed a well deserved bronze medal with 249.44 points. Skating to a Tango medley, he hit a wobbly quad toe-double toe combo, aontehr quad toe and two triple Axels but doubled a Lutz and like Plushenko had an illegal repetition, a triple loop in his case. “Maybe I was a little nervous. Not everything worked. My coaches and I set the goal to skate as clean as possible at Nationals, it was almost perfect in the short, not in the free, so I still have something left to work on”, the Muscovite explained. Konstantin Menshov came back from a disappointing short, to finish fourth at 230,13 points, but his performance wasn’t ideal. He overrotated the first quad toe, then did a quad-double toe combo and landed five more triples including two Axels, but most landings were edgy. Adian Pitkeev is a discovery of the season. The 15-year-old turned in a solid free skate to “Art on Ice“ that included a triple Axel-triple toe, another triple Axel and four more triples as well as good spins. He has a nice quality about his skating. The only errors were a stumble in the choreosequence and a doubled loop. Pitkeev, who trains with Eteri Tutberidze and Sergei Dudakov, placed fifth with 224.25 points. Artur Gatchinski did a bit better in the long than in the short and pulled up from 12th to sixth at 224.17 points. He stepped out of his quad toe, but landed two triple Axels. His program to “Anna Karenina” is really nice, but he needs to get his act together and also learn to do triple-triple combinations. Zhan Bush produced a quad toe and triple Axel, but fell on a cheated triple Axel and run out of steam towards the end (7th/217.40 points). So far, his move to Moscow hasn’t really done much for him. Alexander Petrov came eighth with 216.47 points. He is a dynamic skater. He did a triple Axel and six more triples, just stumbled on his second triple Axel. Mikhail Koliada had to withdraw as the laces of his boot came undone and he was unable to fix the problem. Plushenko led the Men after the short program. There was not a huge crowd in the Olympic ice rink Tuesday afternoon, but they cheered loudly when the three-time Olympic medalist took the ice. Plushenko had drawn to skate 7 th out of the 18 men, and was the first of the top contenders. The 31-year-old nailed his opening quad-triple toe combination and followed up with a triple Axel and triple Lutz. The spins were slow, though, but two still got a level four and the last combo spin was a level four. Skaters and coaches on the team tribune rose to give Plushenko a standing ovation. The top star had ditched his short to “The Girl Like You” and now is skating to “Tango de Roxanne”. Tango is a style the seven-time European Champion always has embraced and does very well, however, the other program was something new and different and it is a shame that he decided not to keep it. Plushenko posted a score of 98.41 points. Scores at National Championships are always somewhat high. “I am overall pleased with today’s performance, because I did everything I had planned”, the Olympic Champion commented. “First of all this was the quad-triple toe combination, which was especially important to me.” While Plushenko was happy with his jumps that were indeed well executed, he admitted that the spins could have been better. “The only thing I still have to work on are the spins, because they were rather weak. I didn’t compete for a long time”, he explained. “My legs were a bit heavy. An athlete has to compete after all. I did only one competition this year because of injuries, but the most important competition is still ahead.” The three-time World Champion also noted that he switched to “Tango de Roxanne”, because he used it partially before in former free skating program , he likes it and feels it very well. The main focus was on Plushenko, obviously, since he is the living legend, but two other men are not far behind. Up and coming Maxim Kovtun, 18, went for two quads in his Flamenco short program. He landed a quad Salchow-double toe combination and a shaky quad toe as well as a triple Axel to score 93.08 points. Sergei Voronov produced a quad-triple toe, triple loop and triple Axel in his routine to “Two Guitars”. He is ranked third at 89.10 points. Kovtun revealed that his preparation for Nationals wasn’t the best. He had health problems after the Grand Prix Final, but declined to specify what exactly bothered him. “I also had jetlag”, the teenager said. “Overall I’m happy that I was able to overcome myself. It was pretty nerve-wrecking. I didn’t do full run-throughs of my programs, I just did bits and pieces and focused on the elements.” Kovtun confirmed that he wants to go for three quads in the free skating. Voronov plans two quad toes in his free skating. He also was very happy with the short program. “This Russian Championship is especially nerve-wrecking, because it is the Olympic season. All the guys are skating at a high level. Most of all I was able to deal with my nervousness. In general, everything went well. Probably in the future I’ll need to do minimum a (triple) Lutz in the short program”, Voronov noted. 15-year-old Adian Pitkeev suprisingly sits in fourth with 76.76 points. The ISU Junior Grand Prix Final silver medalist hit a triple Axel, triple Lutz-triple toe and triple loop. He has improved a lot and is nice to watch. Some others disappointed on the other hand. Zhan Bush, who now trains in Moscow under Svetlana Sokolovskaia, did a three-turn out of his quad toe and stumbled on the triple Axel (5 th / 72.46 points). Mikhail Koliada, a dynamic young skater from St. Petersburg, missed his triple Axel but recovered to land a triple Lutz-triple toe and a triple flip (6 th / 75.11 points). Konstantin Menshov finished tenth as he stepped out of the quad toe and the triple Axel and had no combination. He had changed his program content and replaced the triple Lutz with a triple Salchow. Artur Gachinski fared even worse. He crashed on the quad toe and also fell on a triple Lutz-double toe combination. He faded to 12 th at 69.10 points. One more skater landed a quad-triple toe combination, Moris Kvitelashvili from Moscow. But he missed the triple Axel and triple Lutz to finish 11 th at 70.47 points. The Ladies competition had the highest level. The depth of talent in Russia is amazing and these girls are continuing to push each other. There are so many strong girls that enough of them should make it past puberty to secure a bright future for Russian Ladies’ skating. Adelina Sotnikova claimed her fourth National title and she is just 17 years old. The Muscovite started off with a strong short program that included a triple toe-triple toe, triple flip, double Axel and her new trademark camel spin variation. She led with a little more than two points over Julia Lipnitskaia in the short. Adelina then followed up with a strong long program, an important step for her as she has had great shorts and not so great longs in the past, most recently at the Grand Prix Final earlier this month. Sotnikova opened with a triple Lutz-triple loop combo, but underrotated and stepped out of the loop. But then she reeled off five more triples including double Axel-triple toe, skated with a lot of power and expression to „Introduction et Rondo Capriccioso“. Lipnitskaia narrowly won the free, but Adelina remained in first at 212.77 points. “I still can do better than that. I’ve been skating here well on this ice not for the first time. I really like this ice and apparently it likes me as well. I had a lot of emotions at the end of my program. It was a good way to end this year”, the European silver medalist commented. Lipnitskaia hates skating last in the warm up group, because she doesn’t like to take her skates off and then feels stiff. This time, she had to skate last in her group in both programs but coped well. The triple Lutz-triple toe combo in the short was shaky, but the triple flip and double Axel were strong, and as usual, her spins were a special treat. Performing to “Schindler’s List” in the long program, Julia nailed almost everything – triple Lutz-triple toe, double Axel-triple toe and three more triples, just a loop was underrotated. She has improved her speed and ice coverage and show nice lines and elegance. With 210.81 points, she earned silver. „I am most of all pleased that I was able to cope with the last starting number. I’ve skated last several times and never clean. I was completely calm today when I was skating. I like the blue-white colours of this ice rink, they are calming”, the 15-year-old noted. Elena Radionova took the bronze medal with 202.01 points and two strong performances as well. In her short she decided to replace the loop with the flip to make it more difficult. She was enjoyable to watch in her Latin American inspired „Frida“ program and all her jumps looked easy: triple Lutz-triple toe, triple loop-triple Salchow, three other triples and her fast spins. “This was the best competition of the season. I skated very well in both programs and I was confident on all the jumps. Now I’m taking a short break and then I’ll start again with new energy. I want to qualify for Junior Worlds, I think, I can do it, and skate well there”, the 14-year-old commented. Alexandra Proklova trains with Radionova in the group of Inna Gontcharenko. She finished fourth in her debut at Nationals with 195.39 points. Both programs were strong and included triple-triple combinations, a triple Lutz-triple toe in the short and a triple flip-single loop-triple Salchow in the free. Both program were clean, she had good speed and her spins were strong as well. Plus the 13-year-old has strong presentation skills. She skated with more confidence than at the Junior Final. Coming fifth was a little victory for Alena Leonova, who had a rough start to the season (187.48 points). Alena skated first in the short program and presented a new program to Russian Folk music, “Barynia” and “Kalinka”. The program was quite nice but the music choice is rather juniorish. She had skated to Barynia before, in the 2009/10 season and said that she felt good with it right away. It did seem good for her confidence, since she turned in a clean performance with triple toe-triple toe and a triple flip. There were a few errors in her “Carmen” long program. The triple toe-triple toe was good, but she almost fell on the triple Lutz and doubled a Salchow. Overall she was very focused on the jumps. Serafima Sakhanovich, the current Junior Grand Prix Final silver medalist, skated well to finish sixth at 183.58 points. The 13-year-old from St. Petersburg was a bit shaky, but pulled off six clean triples in the long including flip-toe and flip-Salchow. One double Axel was underrotated and she also underrotated the triple flip-triple toe in the short. Evgenia Medvedjeva came seventh with 181.86 points. She has a nice flow and of course triple-triples in her arsenal, a triple flip-triple toe in her case. She fell on a triple loop in the long program. Anna Pogorilaya couldn’t quite repeat her success from the Grand Prix. She appeared a bit tired and had to fight for some jumps and not everything was clean. But she hit her triple Lutz-triple toe in the long program and placed eighth at 180.88 points. Nikol Gosviani, who is only 17, but looks very grown up and elegant, finished ninth (176.54 points). He short featured a triple toe-triple toe combination. In the long Nikol produced five triples, but a double Salchow and single flip in the middle of the program cost her a lot. In this cut-throat competition you cannot afford to make mistakes. Lisa Tuktamysheva has been struggeling all season and no wonder happened in Sotchi for her. Last year, she was Russian Champion, this year, she faded to tenth at 175.59 points. She fell on the triple Lutz-triple toe in the short program. In the long she hit that combo, although the toe was underrotated. She also fell on a triple flip and lost points on a double Salchow and a double toe that should have been triples. 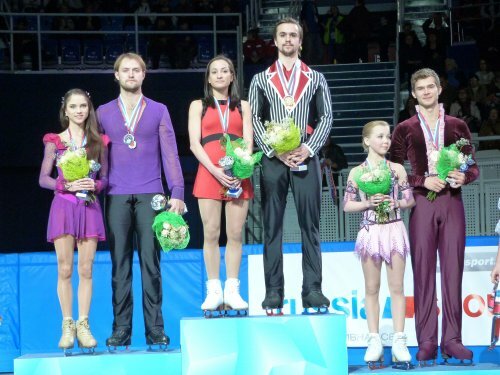 Ksenia Stolbova/Fedor Klimov edged out Vera Bazarova/Juri Larionov to win their first National title. Overall the competition was disappointing, there were many errors. Maxim Trankov, who was commentating for Russian TV, probably wasn’t pleased to see that. The Russian pairs need to step it up if they want to confirm their leading position in the discipline once Tatiana Volosozhar/Maxim Trankov retire. The World Champions by the way sat out the championships according to their long term plan for the season. They want to compete again at Europeans next month in Budapest. 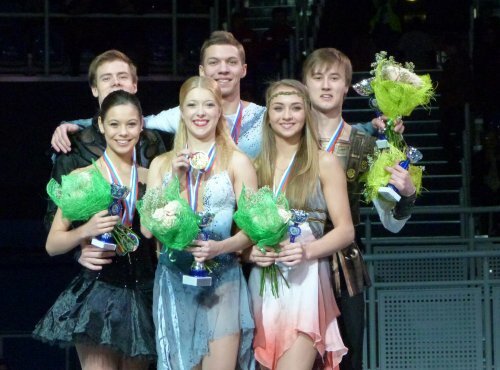 Maria Vygalova/Egor Zakroev from Perm are a junior team and finished second at the Junior Final. They put out a nice performance to “Giselle” to pull up from fourth to third at 182.35 points. Their pairs element have a good quality, and she knows how to sell a program. They landed triple throws and the only glitch came when Maria touched down with her hand on the double Axel and couldn’t add the double toe for a combination. Their lively short to “Capone” was clean, including the double Axel. Obviously, they still need to add a side by side triple jump to their repertoire. Unfortunately they cannot continue in juniors next season as the age limits have been lowered and Zakroev turns 20 in a few days. “Coming here we didn’t plan to finish in the top three. We are thrilled to have won the bronze medal at senior Nationals. We skated well and got good scores, too.” The team now hopes to qualify for Junior Worlds after missing out last year. Julia Antipova/Nodari Maisuradze had high ambitions, but settled for fourth place after a mediocre free skating (174.97 points). Skating to “Money” and “Great Gig in the Sky” by Pink Floyd as well as “Back in Black” by AC/DC (music that Nodari, who plays in a rock band enjoys), they started with a quadruple twist, but the catch was not good. She then missed the triple Salchow and two-footed the throw triple loop. The triple toe was good and so were two lifts, but on the entry to the last lift he somehow dropped her and they omitted the element. The couple from Moscow produced the highest triple twist of the day in the short program, but she two-footed the throw triple flip and touched down on the triple toe. Vasilisa Davankova/Andrei Deputat placed fifth with two solid performances at 173.09 points. He wobbled on the triple toe and stepped out of the double Axel in their “Notre Dame de Paris” long program while she landed the throw triple twist on two feet – but he had thrown her so awkwardly that it was great she was able to hold on to it at all. The Junior Grand Prix finalists looked a bit slow, though. In the short program, he had stumbled in the footwork, the rest was fine. World Junior bronze medalists Lina Federova/Maxim Miroshkin didn’t have their best skate in the short. She fell on the double Axel and two-footed the throw triple toe. They looked really disappointed in the Kiss & Cry. The team rallied back in the long program to “Cabaret” and nailed all their elements except for her stumble on the triple toe. They pulled up from ninth to sixth at 172.80 points and were ranked fourth in the free skating. Katarina Gerboldt/Alexander Enbert made several errors to finish seventh with 172.37 points. In the short, she missed the triple Salchow (and underrotated in the free), in the free, they singled the throw triple loop and she two-footed the throw triple flip. This team now trains under Oleg Vasiliev. Evgenia Tarasova/Vladimir Morozov, who train together with the top two teams in the group of Nina Mozer, sat in third with clean short program that was highlighted by a huge triple twist. Unfortunately they had a complete melt-down in the long program. He fell on the solo triple toe and Salchow, the throws were not clean and then they crashed on the last lift. The fall looked really scary and Evgenia was obviously in pain, crying, but they still finished the program – the pair combo spin was left. Later the team doctor said that she suffered no serious injury. Tarasova/Morozov dropped to seventh eighth at 169.06 points. Ekaterina Bobrova/Dmitri Soloviev claimed their fourth National title with strong performances. Elena Ilinykh/Nikita Katsalapov couldn’t really challenge them this time. Bobrova/Soloviev skated to a strong lead of 4.60 points in the short dance already . They earned a level four for the Finnstep, their lift and the side by side footwork I their performance to Quickstep, Foxtrot and Quickstep (“Diamonds are a Girls Best Friends”, “I Want to be Loved by You”). Ekaterina wobbled on the twizzles, though, that were a level three. “We are happy with the result, but this was just a standard skate without a lot of emotions and a little error on the twizzles”, Soloviev said. “Following the Grand Prix Final, we put a lot of emphasis on the compulsory dance. We are probably the only ones that got a level four on it here. We’ve worked a lot on that and we don’t want to lose our position. We did a lot of run throughs of the program and skated our short and free dance before audiences. So we are very well prepared”, Bobrova added. There were no errors in the free dance. The lifts, spins and twizzles got a level four, the footwork a level three. But the “bird drama” to “Four Seasons” and “Lacrimosa” is rather boring. The European Champions totaled 179.90 points. „We are happy to have skated clean for the first time in three competitions. Emotionally and technically it was a good performance and we’ll build from there”, Dmitri commented. Ilinykh/Katsalapov performed their short dance to “Bei mir bist du schoen” with a lot of passion and got the most applause, but their levels were lower than Bobrova/Soloviev’s: just a level 3 for everything except the rotational lift, plus he put down his foot in the side by side step sequence and she had trouble to keep up with him in the twizzles. The reigning European silver medalists started well with a beautiful combination lift into their “Swan Lake” program (which turned out to be a sort of “bird drama” as well this time), but then they crashed on the entry to the next lift. They omitted the lift and needed a few seconds before getting back into their program. At least they were able to pull themselves together and perform well and they had the same levels as Bobrova/Soloviev for the remaining. In addition to the two-point deduction for their fall they also were punished with one deduction for the interruption of their program. Poor Elena was in tears, but found her smile again by the time of the press conference. “Our blades clashed and so we fell”, she explained. “It would have been the best free dance of the season if we hadn’t fallen. We were ready emotionally and physically, we even wanted to improvise in the program, wanted to skate ideally, maybe therefore this mistake that never had happened before in practice or competition, happened today”, Nikita added. Viktoria Sinitsina/Ruslan Zhiganshin danced to the bronze with two strong performances (165.60 points). Both dances looked smooth, and the 2012 World Junior Champions picked up good levels. “We are very happy to have finished third. We did our job, skated clean. Now the Federation will decide, we’ve done everything we can do. I really hope we get to go to Europeans and I can compete with my sister Nelli”, Ruslan explained. Nelli Zhiganshina has moved to Germany and is German Champion with Alexander Gazsi. Ekaterina Riazanova/Ilia Tkachenko had to settle for fourth place at 163.99 points. They skated well, but the level-two twizzles in their „Phantom of the Opera“ free dance cost them the two points they would have needed to make the podium. Ksenia Monko/Kirill Khaliavin performed well but were a bit bland compared to the top teams and came fifth (155.59 points). Alexandra Stepanova/Ivan Bukin ranked sixth in their debut at senior Nationals (151.80 points). They skated clean, but had just level two in the footwork in the free dance and as well as in the short dance and a level one for a Finnstep pattern. These low levels cost them important points.